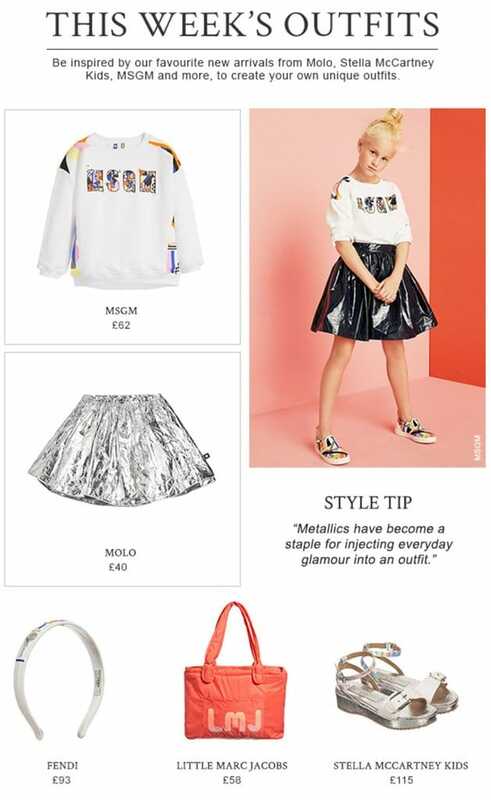 Be inspired by our favourite new arrivals from Molo, Stella McCartney Kids, MSGM and more, to create your own unique outfits. Every girl’s wardrobe should be filled with fashionable and stylish clothes for everyday wear and special events. All parents want their precious ones to look great and feel good in the clothes they wear. Consider choosing some of the outfits offered by MSGM for a start. The brand provides clothes made of the finest materials and distinguished by exceptional quality. They will ensure freedom of movement and comfort of your little girl. Consider choosing a white long-sleeved cotton shirt with a colorful print on it. This can be combined with an A-shaped silvery-black skirt by Molo that will make your little one look cool and stylish. Such outfit can be worn at special occasions or some formal events. The Fendi brand provides a number of cute accessories to combine with the chosen clothes. You can choose the most suitable options to match your kid’s outfit. Little Marc Jacobs provides another good option. It is a bright orange bag in which your precious one can keep her necessities to always have them at hand. The bag is very convenient with multiple pockets. It will suit absolutely any outfit and will brighten up the looks of your princess. Finally, Stella McCartney Kids offers some of the finest footwear you will ever find on the market. All footwear is made of the best-quality materials and the soles of each model are hardly to ever wear out. Besides, all footwear is available in a variety of colors to match your girl’s outfit. It features colorful patterns and prints that will underline the style of your kid. Don’t hesitate to check out the collections of world-famous brands to choose some of the best-quality and stylish pieces of clothing for your little fashion-lover. The brands presented on our website have a lot to offer to the young customers and you will surely find an excellent option for your child. All young girls are keen to wear fashionable clothes for different special events and as a casual outfit. If you want your little princess to be dressed in stylish clothes, you should definitely check out the collections of such brands as MSGM, Fendi, Little Marc Jacobs and some others. They provide a great variety of shapes, colors and color combinations. We recommend you to look though the collection of MSGM first. It is filled with clothes of exceptional quality and incomparable style. You might choose a white cotton long-sleeved shirt by Molo featuring a brightly colored print that will diversify the wardrobe of your child. This can be added with a nice metallic black skirt that features an A-shape and can be matched with a number of bright tops. But no outfit is complete without some cute accessories. Fendi offers a great variety of matching accessories that will make your girl even more good-looking and stylish. As for the footwear, we recommend you to look through the collections of Stella McCartney. It is filled with bright colors and beautiful shapes. Light summer sandals are available in different colors and have durable soles that are functional, comfortable and easy to clean. Your child will absolutely adore wearing the footwear by Stella McCartney. The designer uses only high-quality materials for her creations. Finally, a good durable bag is a must-have item for every little fashionista. A good option is a red bag with a white print offered by Little Marc Jacobs. It will help your princess to keep all the necessities at hand. It is extremely convenient and fashionable. The bag can be matched with a great variety of outfits for different occasions. Look through the collections of world-class brands without hesitation and you will definitely find some excellent options for your girl to wear at special events and on a daily basis.